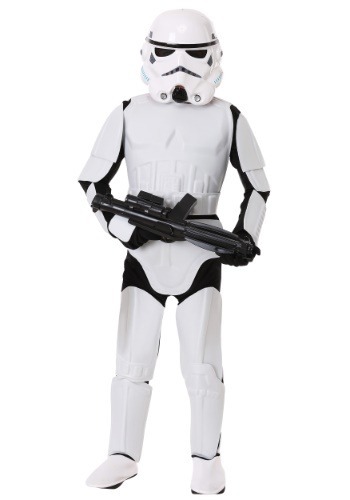 You can slip into a costume that has true authenticity with this kid’s deluxe Stormtrooper costume. The uniform features a polyester jumpsuit with attached molded white EVA rubber pieces that include: chest and abdomen plates, three pieces for each arm, shin guards and thigh sections. The costume also comes with a white rubber belt. In addition, there is a two-piece white plastic PVC helmet that includes eye and nose holes and fits together with Velcro. Feel like you sprang right from the films with this officially licensed Star Wars costume. Add a Stormtrooper blaster to keep the Rebels at bay.